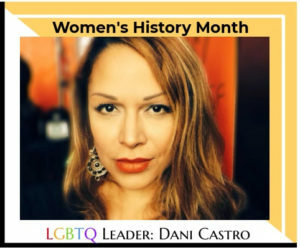 This women’s history month, the Network celebrating the leadership of LGBTQ and allied women by highlighting the work of some amazing Californians. Up and down the state these women work to improve the lives of LGBTQ people in their communities, while inspiring people around them. We asked them to share some of their wisdom with the Network. Do you have another amazing LGBTQ woman you’d like to recognize? Shout out their name in the comments section! 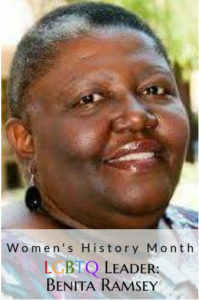 Benita Ramsey is a Reverend at Unity Fellowship of Christ Church Inland Valley and a longtime social justice advocate in the Riverside. 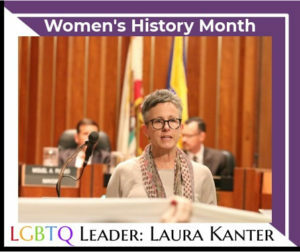 Laura Kanter is the Director of Policy, Advocacy and Youth Programs at the LGBT Center Orange County – and a tireless advocate for LGBTQ youth and all marginalized communities. What’s one thing that has helped you succeed as a queer woman? “What has helped me as a queer woman is to surround myself with other queer feminist women who speak truth to power and who refuse to force themselves into prescribed gender roles and behaviors. I don’t know if this has helped me to succeed, or made things more difficult but I will not let straight women define me as a woman. Sometimes this pisses other people off. So what has also helped me is to be uncomfortable myself and to make other people uncomfortable. Dani Castro is a Research Director at the Center for Excellence for Transgender Health at UCSF, a co-founder of Trans Advocates for Justice and Accountability (TAJA), and community advocate. 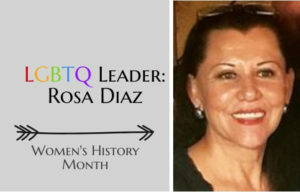 Rosa Diaz is the Founder and CEO of the Imperial Valley LGBT Resource Center – providing a safe and welcoming space for LGBTQ people along the California-Mexico border since 2015. 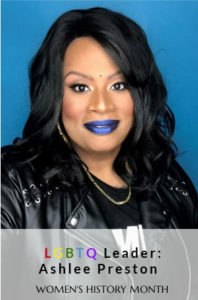 Ashlee Marie Preston is the host of the radio program “SHOOK w/ Ashlee Marie Preston,” an transgender activist, media personality, speaker, and writer. 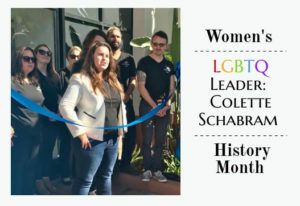 Colette Schabram is the Executive Director of Pacific Pride Foundation in Santa Barbara, which is home to a dynamic range of services and activities that support individual LGBTQ+ people in their efforts to achieve a positive sense of identity, purpose, social support and well being. 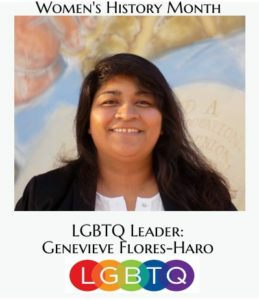 Genevieve Flores-Haro is the Associate Director at Mixteco/Indígena Community Organizing Project, where she supports the organization’s policy priorities, she also supervises programs specific to health advocacy, mental health and domestic violence, including two multi-year mixed methods research studies. She also sits on the Board of Directors for Ventura County’s local LGBT organization Diversity Collective, and is a Member-At-Large for the Ventura County Women’s Political Council. “I would say to not be afraid of your voice, and to use your voice unapologetically. Too often as women, we’re told to stay quiet, to make room for others to speak, or to apologize for speaking. We forget, or we don’t realize, that we have a voice of our own and it’s powerful in its own right. And we can use our voices to share our stories and lift up those voices who are in the margins even within our ranks, like our non-English speaking, immigrant women.